While quite new in recovery from alcoholism and addiction I was “delivered” to the sponsor who “got me” and who I came to respect, trust and love. Her near daily words to me were “mind your own business”, “your head is no longer for rent” and “write a gratitude list”. Today I have learned to expand and improve upon these through the practice of remembering that what I choose to think and focus on fuels my feelings- emotional, physical and spiritual and in turn drives my actions and behaviors. One of the most empowering realities is this fact: I can always choose the thoughts I focus on. Choosing to think in a positive and productive mode actually changes my brain chemistry, function and certainly all my feelings, actions and behaviors. Learning to let go of chronic free-floating fearful worrying, or self-destructive thoughts allows us in the recovery process to become the happy, joyous and free individuals we are meant to be. Breathe: This is always important. It may sound silly, but remembering to breathe, taking full relaxing breaths and taking the time to do so, quietly and mindfully works wonders for de-stressing, warding off anxiousness and can help us focus anytime, anywhere. Take a Body Scan: Take 5 to 10 or even 45 minutes regularly to lie quietly. Rest your mind by consciously focusing and become aware of your body parts from your toes to the top of your head. Be aware of your body. Focus on being in the present Let your random thoughts and emotions flow without judging them. Just being and integrating body, mind and spirit is renewing, relaxing and can help bring us into the present- the gift of recovery. Positive Journaling or taping: This is not a daily inventory. Make a decision that this journal is all and only about progress. Acknowledge daily your strengths, accomplishments, assets. List what went well, how you managed well. Set a reasonable daily goal and acknowledge your progress. What did you learn today or remember to remember? What are you grateful for today? Use this throughout the day. Take note of the best part of your day- no matter how hard the day has been or seems to be. By ending your day with acknowledgment and by focusing on what you’ve been able to do, gratitude will relax and help focus you for rest and prepare you to greet a new day. Throughout the day: recognize that thoughts and emotions are transitory, fleeting and do not define you. Choose the direction of your focus and let go of negative projection. Tune into physical sensations, and your other senses, sights, sounds, smells, tastes to help ground you in the now. As my sponsor said then, “You are all you can handle” it remains true today. Even as parents, partners, friends, bosses, co-workers, “First Things First” means keeping our focus on our own progress, and will help us to allow those in our lives to effect their own. The 12 step program of AA is the original holistic approach to healing and recovery from addiction, alcoholism and the many of the resulting negative effects and symptoms. Working the steps in their order with a sponsor and continuing to apply these cannot be replaced or substituted. 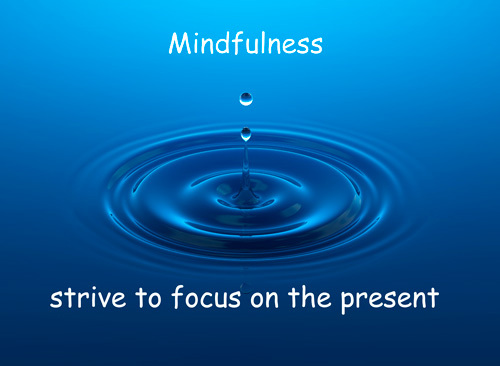 Utilizing mindfulness practices helps us to feel and be positive, focused and enthused in the present. Taking time to connect with self, in a 24/7 full access world is essential. These practices have been found to improve the immune system, brain function and improve our healing. These practices will facilitate our ability to succeed in assessing, acknowledging and becoming willing to release the grip of the disease of addiction and the “defects” or defective habits developed in its process. “It’s about living your life as if it really matters, moment by moment by moment” Jon Kabat-Zinn – an excellent, learned resource for mindfulness resources and knowledge. Thank You. Trying for admission please. I’m new to this blog…appreciating the insights and encouragements.